The iPhone 4 is recognizably an iPhone, bearing most of the same traits as all the other iOS devices Apple has released over the past three years: Glass front, rounded corners, big screen, circular button at the bottom. The white model, sadly unavailable on launch day, exposes that the iPhone owes a design debt to the classic iPod as well. In general, the product feels like a remarkably solid slab of technology. It’s thinner and narrower than its predecessors, but the same height. Since it packs its 4.8 ounces into a smaller space (4.5 inches by 2.31 inches by .37 inches), it’s noticeably denser—and I mean that in a good way. Like the iPad, the iPhone 4 feels like a remarkably solid, well-built product. The fit and finish are immaculate; not a single thing about the iPhone 4 feels cheap. If you don’t like my cake metaphor, try this one: in terms of styling, the iPhone 4 feels like the most expensive electric razor ever made, or maybe like a finely-tuned luxury watch. Apple has designed the iPhone’s steel frame to act as its wireless antennae; the strip of frame on the device’s left side serves at the antenna for its Bluetooth and Wi-Fi radios, and the strip on the right side and bottom works as a cellular antenna. Attempts to quantify cell phone reception are always dodgy—reception varies from city to city and even block to block within a city. One of our editors reports that her iPhone 4 can actually get a (weak) signal in her apartment, where her iPhone 3G simply reported no service at all. 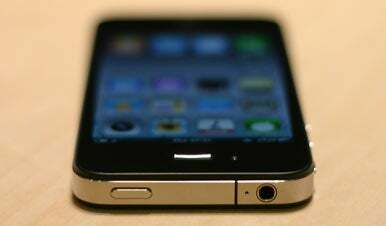 Our colleagues at PCWorld report that the iPhone 4 has faster data speeds than the iPhone 3GS. In my testing, the iPhone 4 was extremely fast, especially when it came to data uploads. This boost in upload speeds is due to the iPhone 4 supporting HSUPA, a high-speed 3G upload protocol, in addition to the HSDPA protocol that was added to the iPhone line with the 3GS. In any event, the iPhone 4 was so fast, it put my poky old home DSL connection to shame—so much so that I’m finally going to replace it! But unless you live in my particular suburban San Francisco neighborhood, your mileage will likely vary. Now about that cellular antenna. Reports all over the Internet suggest that if you hold the iPhone 4 in such a way that your hand makes contact with both antennae (generally by holding the phone down toward its base, specifically touching on the left side), you can drastically decrease the iPhone 4’s cellular reception. The method of holding the iPhone in question is actually how I hold my iPhone—and I discovered, sitting in my own house, that I could slow or even stop my iPhone 4’s cellular data transfer by holding the phone in that way. It was such a dramatic effect that I was able to cause cellular data transfers to fail mid-stream just by shifting the phone in my hand. I’m not a cell phone engineer. Nor have I had the time to compile a detailed, scientific study of iPhone 4 performance to nail down just what’s causing this signal loss issue. (One would hope some Apple employees who qualify as the former are busily doing the latter right now.) What I do know is that when I hold the iPhone 4 as I am accustomed to holding it, in many cases the phone completely fails to transfer cellular data. And that’s not good. I expect Apple will address this issue one way or another, either with a software fix or a hardware recall. For everyone’s sake, I hope it’s fixable in software; at the very least, I think Apple owes a free bumper to everyone who is affected by the problem while the company figures it out. 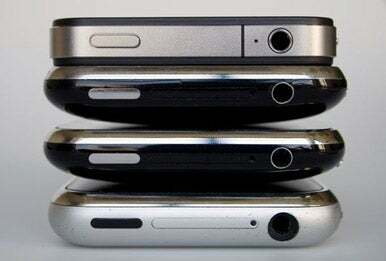 Four generations of iPhone, from oldest to newest. The new iPhone is much thinner than its predecessors. In terms of ports and the like, the iPhone 4 is similar to its predecessors. There’s a standard Apple dock connector on the bottom, right between the speaker and microphone. The device’s left side still has a hold switch and volume up/down controls, though they’ve been redesigned: the hold switch is broader and slightly harder to budge; the volume rocker has been replaced by two discrete volume buttons, etched with plus and minus symbols. On the phone’s top is the Sleep/Wake button, a standard headphone jack, and a new addition: a second microphone. This new microphone can be used in a few different ways: when you’re shooting video or video chatting via the new FaceTime feature, it’s the primary microphone. When you’re holding the phone to your face and speaking via the microphone on the bottom of the phone, the top microphone is gathering in ambient sound to be used for noise-cancellation purposes. The trick seems to work, too: One of the first calls I made with the iPhone 4 was to a colleague, also with an iPhone 4, who apologized for the loud alarm going off in the background. “What alarm?” I asked him—because I couldn’t hear it at all, only the sound of his voice. The iPhone 4’s noise cancellation won’t make your voice sound like you’re whispering into the ear of your interlocutors—it’s still a cell phone call, after all—but it does seem to do a decent job of dropping out extra junk and leaving just the sound of your voice behind. The iPhone 4’s right side is barren of landmarks, save a micro-SIM slot like the one found on the 3G iPad. By using a micro SIM, Apple freed up some space on the inside of the phone, while also ensuring that your old phones with full-sized SIM cards wouldn’t be compatible with your new devices without some SIM surgery. The only part of the iPhone 4 design that gives me pause is the all-glass back, which doubles the chance that if you drop the iPhone, you’ll end up hitting with the glass side down. I never really liked the polycarbonate back of the 3G and 3GS, but at least it was nearly bulletproof. As gorgeous as the iPhone 4 is to look at, I fear that most people will be cloaking them in protective cases in order to avoid shattering this shiny new toy. Macro shot of the iPhone 4 display (top) and the display on the iPhone 3GS. 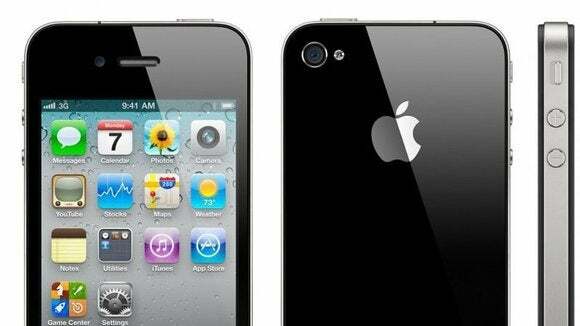 If there’s a single feature that defines the iPhone 4, it’s the device’s new high-resolution screen. Dubbed the “Retina display” by Apple, it’s got four times the pixels of previous iPhone models, packed into the same space. This 960-by-640 pixel display has a screen resolution of 326 pixels per inch, up from 163 ppi on previous iPhone models. When the first iPhone was released, its screen was amazing because 163 ppi was already a much higher resolution than the average computer screen. I shouldn’t even use the past tense there: the original iPhone screen is still quite good. Looking at it by itself, you can notice some jaggedness, but it’s nothing compared to what you’d get on a traditional computer. But technology has moved along. When I spent a week with a Google Nexus One smartphone earlier this year, I was impressed by its higher screen resolution, which made text on the Nexus One noticeably smoother than on my iPhone 3GS. Apple’s response to the improvements in display technology has not been to create a larger phone—a direction some of its rivals have taken—but to increase the number of dots in the existing space to the point where the average human eye (hence the “retina display” moniker) can’t even tell they’re there. The result is marvelous. The retina display is an enormous improvement on the already-good iPhone 3GS screen, brighter and with better contrast as well as a slightly warmer color temperature. The screen, which uses the same IPS (in-plane switching) display technology found on the iPad and iMac, has a massive viewing angle, so even at an odd angle you can see everything on the screen clearly. And since the screen is bonded to the layer of glass immediately above it, it’s a bit closer to your eyes—there’s less of the sense that you’re looking at a display through a layer of glass than there was on previous iPhones or the iPad. As for the increased resolution, it’s staggering. High-definition videos play back with such smoothness and clarity that you feel like you’re looking through a tiny window into the real world. Tiny details on photos are clear as day. When I watch a video on my iPhone 3GS, I don’t notice that the individual stalks of wheat in the Van Gogh episode of Doctor Who aren’t clear. But when I watch that same in HD quality on the iPhone 4’s screen, I can see the individual kernels on the stalks. It’s the same scene, but with exquisite detail that was lacking before. Text is similarly gorgeous. Yes, black text on a white background in Safari or iBooks looks like it was printed on paper. But what really exposes the power of the display is colored or gray text, which tended to look a bit jaggier on previous iPhones. On the iPhone 4, even light gray text is immaculate. If you’ve not yet seen an iPhone 4, you may stare at your current phone (or even PC screen) and wonder how this new display could be that much better than what you’ve already got. After I handled the iPhone 4 a few weeks before its release, I couldn’t quite believe what I had seen. When I stared at my iPhone 3GS display, I saw a really good screen. How could the iPhone 4’s screen have put it to shame? And yet, when you view the two models side by side, you can see that the difference in quality isn’t even subtle. The iPhone 4’s screen is so good, it’s shocking. We are rapidly approaching the day where every device we own will be able to shoot HD video. Is the oatmeal in the microwave boiling over the side of the bowl? Check the HD video. Did the washing machine get that stain out of your favorite shirt? HD video. A mountain lion ran right across the trail in front of your bike? HD video or it didn’t happen.